Memorial erected by the Monument Building Committee of Japan to honour hundreds of Japanese who worked, lived and died in Torres Strait between 1878 and 1941 and their contribution to the pearling and fishing industies. 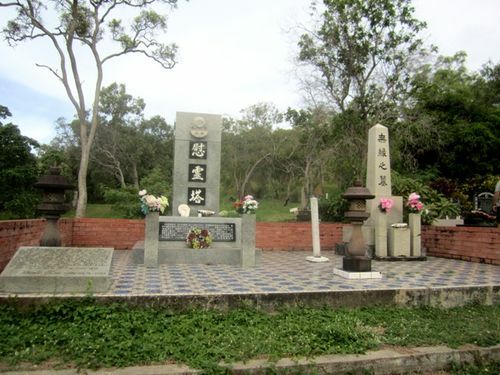 The memorial on the left honours who died while pearling in the Torres Strait area while the memorial on the right honours Japanese shop owners and other business people who died on Thursday Island. A resident of Japan established a trust of about $100,000 to ensure the future maintenance of the Japanese gravestones. Japanese divers made a significant contribution to the development of the pearl-shell industry in the Torres Strait. Europeans who established the industry in the Strait in the late 1860s and early 1870s relied initially on South Sea Islander labour, who tended to dominate (often violently) the Torres Strait Islanders. In the 1870s boats equipped with helmeted apparatus for divers appeared, and in the 1880s the pearl-shellers turned to a more skilled and less confronting labour supply - Japanese divers recruited principally from Hong Kong and Singapore. In the 1880s the proportion of Japanese divers in the Strait was no greater than any other ethnic group, but from 1891, when the Japanese Government removed its ban on emigration, numbers increased significantly. By 1893 the Japanese were the largest ethnic group in the Torres Strait pearl-shell industry, and completely dominated the industry between 1900 and 1940. PRINCIPAL ENTERPRISE OF NORTHERN AUSTRALIA. IN THE TORRES STRAIT AREA. MAY THE JAPANESE REST IN PEACE HERE.